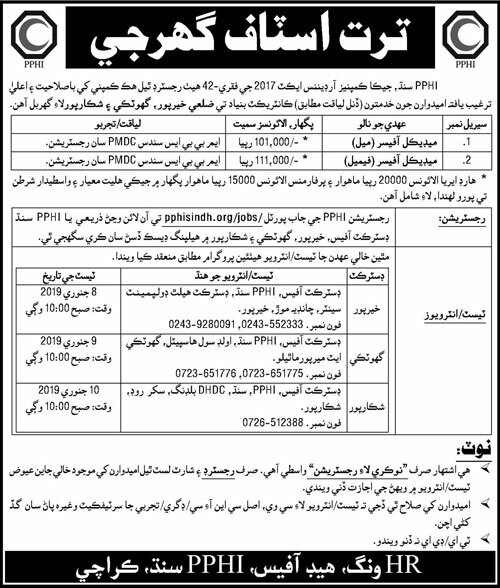 Below are the complete details of the Medical Officer jobs in Peoples Primary Healthcare Initiative in Karachi. Skills Required for Job: Dedication to patient safety and quality of healthcare. Commitment to organization's values and vision. Ability to lead standardization of care. Inspirational to the healthcare team. Superb listening skills. Qualification: Qualification:- MBBS degree in medical must have relevant of working experience in a similar administrative support role. last date for submission of application. Medical Officer jobs in Peoples Primary Healthcare Initiative Karachi, in Pakistan published on Paperpk.com from newspaper on December 29,2018. Job seekers who are already working as doctor , senior medical officer ,Skin Specialist, Medical Specialist, ENT Specialist, Eye Specialist, Child Specialist, MBBS Medical Officer, Radiologist, Staff Nurse, LHV, Doctor, Lady Doctor, Technicians, Pharmacist, Midwives, Gynecologist, MBBS Doctor ,MBBS Consultant, Male Doctorsurgon , lady doctor can also apply for post of Medical Officer.